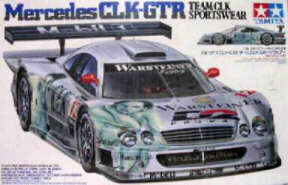 This is Tamiya's excellent CLK-GTR "Team Sportswear" in 1/24 (kit #24201), box-stock save for some bare metal foil used in the engine compartment. Finished in PPG lacquer in a color which has extremely fine flakes. This produced a very nice smooth silver finish, even in this small scale. A really, really fun model to build. Looks great with minimal effort: the parts fit is outstanding, and Tamiya captured the stance of the car very well. This kit would really come alive with even minimal detailing (the decal-based harness looks a bit hokey), but not this time around: just a fun, relaxing OOB. I also have the see-thru version (kit #24206), and I may do a more detailed build on that one in the future.